Arizona Interfaith Movement – Our vision is a world of harmony, good will & peace among persons of all faiths where the Golden Rule is a universal way of life. Arizona is the first Golden Rule State in our Country! This beautiful AZ license plate was originated by AZIFM to be a traveling billboard for kindness, and civility. They are available through Arizona’s MVD at www.servicearizona.com, or contact our office – and help support Golden Rule awareness and education in AZ. The Arizona Interfaith movement’s mission is to build bridges of understanding, respect, and support among diverse people of faith through education, dialogue, service, and the implementation of the Golden Rule. We believe that every religion has some form of the Golden Rule that it teaches its members to live by. We seek to promote the Golden Rule in all that we do. We are not a political organization, and we don’t offer commentary on political issues. Rather, we are an organization whose commitment to the principle of doing right by one another is the foundation of the actions we take. We seek to educate one another about the diverse religious backgrounds that make up our membership, and find common ground between those who hold differing viewpoints. We honor all of those who serve in the interest of the Golden Rule, and we invite you to explore the site, and learn more about who we are, and what we do. Our Vision is a world of harmony, good will and peace among persons of all faiths where the Golden Rule is a universal way of life. The Baha'i faith teaches that throughout history, God has sent to humanity a series of divine Educators—known as Manifestations of God—whose teachings have provided the basis for the advancement of civilization. These Manifestations have included Abraham, Krishna, Zoroaster, Moses, Buddha, Jesus, and Muhammad. Bahá’u’lláh, the latest of these Messengers, explained that the religions of the world come from the same Source and are in essence successive chapters of one religion from God. Bahá’ís believe the crucial need facing humanity is to find a unifying vision of the future of society and of the nature and purpose of life. Such a vision unfolds in the writings of Bahá’u’lláh. The weekend of October 21 and 22 was very special to Bahá’ís as millions of people in thousands of communities throughout the world gathered to celebrate two annual holy days called the “Twin Holy Days”. These holy days celebrate the birthdays of the Founder of the Bahá'í faith, Bahá'u'lláh and His forerunner, the Báb. This celebration was unlike any before as it commemorated the 200th anniversary of the birth of Bahá'u'lláh. The Bahá'í Faith is one of the newest world religions and one of the fastest growing religions having an established presence in nearly every country and totaling over five million followers. Bahá'ís are followers of Bahá'u'lláh, follow His teachings striving for the attainment of the ideals He brought and working collectively within communities worldwide for the betterment of humanity. Bahá'u'lláh, which means the Glory of God in Arabic, was born Mírzá Ḥusayn-`Alí Núrí in 1817 to a prominent, noble family in Iran. Young Mírzá demonstrated qualities and intelligence far beyond his age. He declined a powerful position in the Persian government to serve the destitute and became known as the “Father of the poor” while still in His 20’s. It was during this time that He would learn about the Báb and become a devoted follower. Siyyid Mírzá `Alí-Muḥammad was later known as the Báb, which means “the gate” in Arabic. He was born in Iran in 1819 and took the name, the Bab in 1844. He taught that the arrival on the One foretold in all the ancient sacred writings was imminent and He was to prepare the way for “Him whom God shall make manifest.” The popularity of the Báb rapidly grew into tens of thousands of believers called Bábís, including Bahá'u'lláh. The Islamic clerics grew concerned about the popularity. Many Bábís were tortured and executed for their beliefs. The Báb would be executed in 1850. At this time Bahá'u'lláh began a series of exiles and imprisonments that would last forty-years. It was in a subterranean prison filled with vermin and indescribable squalor, bearing chains that bore their marks in his flesh for the remainder of his life, that a “maiden of God” appeared to Bahá'u'lláh telling Him of His mission as a Manifestation (Prophet) of God. In 1853, with the loss of the Báb, the surviving Bábís turned to Bahá'u'lláh and became Bahá'ís. During His forty-years imprisonment and multiple exiles, Bahá'u'lláh provided hundreds of sacred writings to His believers as well as leaders of the world providing solutions for issues that plague us even now. Bahá'ís believe in oneness of God and there is only one religion that is progressively revealed through a series of Divine Teachers, including Abraham, Krishna, Moses, Zoroaster, Buddha, Jesus, Muhammad, the Báb and Bahá'u'lláh. They advancing humanity’s spiritual, moral and intellectual capacity. Bahá'ís believe in the oneness of humanity. We are one human family and we should work together, supporting each other for the advancement of the world. Men and women are equal. Therefore prejudice of all kinds must be eliminated. Other beliefs include the independent investigation of reality, so the Bahá’í Faith has no clergy. Bahá'ís are expected to study, discern our own truth, using the sacred Writings as guides to that truth. There are no clergy and all are equal, so no one person is more important than another, nor is anyone born a Bahá’í. Each person declares his or her belief. Administrative duties are shared amidst community volunteers. Bahá'ís believe in the harmony of religion and science and the necessity that each holds for the other. Bahá'ís have been in Arizona since 1900, playing an active role with children, youth, justice and the advancement of civilization. If anything you read here piqued your curiosity, please contact us and learn more about what we are doing to create communities throughout the state. “So powerful is the light of unity that it can illuminate the whole Earth.” Bahá'u'lláh Breakout Box More information about the Bahá’í Faith can be found at www.bahai.us Or meet local Bahá'ís by calling 1-800-22-UNITE Angelina Ghrist is a member of the local Bahá’I community. She has worked as an advocate for children’s rights on local, national and international projects. Tibetan Buddhism comprises the teachings of the three vehicles of Buddhism: the Theravada Vehicle, Mahāyāna, and Vajrayāna. The Mahāyāna goal of spiritual development is to achieve the enlightenment of buddhahood in order to most efficiently help all other sentient beings attain this state. The motivation in it is the bodhicitta mind of enlightenment — an altruistic intention to become enlightened for the sake of all sentient beings. Bodhisattvas are revered beings who have conceived the will and vow to dedicate their lives with bodhicitta for the sake of all beings. Tibetan Buddhism teaches methods for achieving buddhahood more quickly by including the Vajrayāna path in Mahāyāna. The Catholic faith teaches that to gain the happiness of heaven we must know, love, and serve God in this world. Man must know, love and serve God in a supernatural manner in order to gain happiness of heaven. Man is raised to the supernatural order only by grace, a free gift of God. We learn to know, love, and serve God from Jesus Christ, the Son of God, who teaches us through the Catholic Church. In order to be saved, all persons who have attained the use of reason must believe explicitly that God exist and that he rewards the good and punishes the wicked; in practice they must also believe in the mysteries of the Blessed Trinity and the Incarnation. By the Blessed Trinity we mean one and the same God in three divine persons, the Father, the Son, and the Holy Ghost. By the Incarnation is meant that the Son of God, retaining His divine nature, took to Himself a human nature, that is, a body and soul like ours. The Church is the congregation of all baptized persons united in the same true faith, the same sacrifice, and the same sacraments, under the authority of the Sovereign Pontiff and the bishops in communion with him. We find the chief truths taught by Jesus Christ through the Catholic Church in the Apostles' Creed. Mary Baker Eddy, who discovered and founded Christian Science, defined it as “the law of God, the law of good . . . ” (Rudimental Divine Science, p. 1). In Christian Science, God is understood to be infinite Love, and so invariably good that a clear glimpse of this through prayer has power to heal, redeem, and restore anyone. A lifelong student of the Bible, who yearned from her youth to find deeper answers to the persistent question of human suffering, Mary Baker Eddy turned wholeheartedly to God when she experienced a critical injury in 1866. As she read accounts of Jesus’ swift, powerful healings, a new sense of God, Spirit, as the only reality flooded her thought and healed her. Impelled to understand the Principle behind this experience, she continued to search for and find in the Bible the underlying laws of God that would form the basis of her teaching and practice of Christian Science. From her time to ours, many have found that when they understand their relationship to God better through this Science of Christianity, their health is restored and character transformed. And each healing inspires a heartfelt desire to help others know and experience how loved we all are by God. Hindu is thought to have gotten its name from the Persian word hindu, meaning "river," used by outsiders to describe the people of the Indus River Valley. Hindus themselves refer to their religion as sanatama dharma, "eternal religion," and varnasramadharma, a word emphasizing the fulfillment of duties (dharma) appropriate to one's class (varna) and stage of life (asrama). Hinduism has no founder or date of origin. The authors and dates of most Hindu sacred texts are unknown. Scholars describe modern Hinduism as the product of religious development in India that spans nearly four thousand years, making it the oldest surviving world religion. Indeed, as seen above, Hindus regard their religion as eternal (sanatama). Hinduism is not a homogeneous, organized system. Many Hindus are devoted followers of Shiva or Vishnu, whom they regard as the only true God, while others look inward to the divine Self (atman). But most recognize the existence of Brahman, the unifying principle and Supreme Reality behind all that is. Most Hindus respect the authority of the Vedas (a collection of ancient sacred texts) and the Brahmans (the priestly class), but some reject one of both of these authorities. Hindu religious life might take the form of devotion to God or gods, the duties of family life, or concentrated meditation. Given all this diversity, it is important to take care when generalizing about "Hinduism" or "Hindu beliefs." The first sacred writings of Hinduism, which date to about 1200 BCE, were primarily concerned with the ritual sacrifices associated with numerous gods who represented forces of nature. A more philosophical focus began to develop around 700 BCE, with the Upanishads and development of the Vedanta philosophy. Around 500 BCE, several new belief systems sprouted from Hinduism, most significantly Buddhism and Jainism. In the 20th century, Hinduism began to gain popularity in the West. Its different worldview and its tolerance for diversity in belief made it an attractive alternative to traditional Western religion. Although there are relatively few western converts to Hinduism, Hindu thought has influenced the West indirectly by way of religious movements like Hare Krishna and New Age, and even more so through the incorporation of Indian beliefs and practices (such as the chakra system and yoga) in books and seminars on health and spirituality. Among the blessings and favors that God has bestowed upon humanity is that He endowed them with an innate ability to recognize and acknowledge His existence. He placed this awareness deep in their hearts as a natural disposition that has not changed since human beings were first created. Furthermore, He reinforced this natural disposition with the signs that he placed in creation that testify to His existence. However, since it is not possible for human beings to have a detailed knowledge of God except through revelation from Himself, God sent His Messengers to teach the people about their Creator Who they must worship. These Messengers also brought with them the details of how to worship God, because such details cannot be known except by way of revelation. These two fundamentals were the most important things that the Messengers of all the divine revelations brought with them from God. Hare Krishna (also called Bhagavatism) is a group of Hindu denominations within Vaishnavism, centered on the devotion or Krishna or other forms of Krishna. We are all spiritual children of a loving Heavenly Father who sent us to this earth to learn and grow in a mortal state. We live our lives to serve Jesus Christ and teach of the eternal plan of our Heavenly Father for each of us. is a form of Christian faith and practice which originated with the Protestant Reformation, [a] a movement against what its followers considered to be errors in the Roman Catholic Church. It is one of the three major divisions of Christendom, together with Roman Catholicism and Orthodoxy. Scientology follows a long tradition of religious practice. Its roots lie in the deepest beliefs and aspirations of all great religions, thus encompassing a religious heritage as old and as varied as Man himself. Though it draws on the wisdom of some 50,000 years, Scientology is a new religion, one that has isolated fundamental laws of life and, for the first time, developed a workable technology that can be applied to help people achieve a happier and more spiritual existence in the here and now. That the development and rapid promulgation of Scientology were made possible, in part by advances in the physical sciences through the first half of the twentieth century, is significant. For it bridges Eastern philosophy with Western thought. In that way, Scientology constitutes Man’s first real application of scientific methodology to spiritual questions. Jainism is an ancient religion from India that teaches that the way to liberation and bliss is to live a life of harmlessness and renunciation. The aim of Jain life is to achieve liberation of the soul. Judaism is an ancient monotheistic religion, with the Torah as its foundational text (part of the larger text known as the Tanakh or Hebrew Bible), and supplemental oral tradition represented by later texts such as the Midrash and the Talmud. A progressive religion well ahead of its time when it was founded over 500 years ago, The Sikh religion today has a following of over 20 million people worldwide and is ranked as the worlds 5th largest religion. Sikhism preaches a message of Devotion and remembrance of God at all times, truthful living, equality of mankind and denounces superstitions and blind rituals. Sikhism is open to all through the teachings of its 10 Gurus enshrined in the Sikh Holy Book and Living Guru, Sri Guru Granth Sahib. Sufism is a school for the actualization of divine ethics. It involves an enlightened inner being, not intellectual proof; revelation and witnessing, not logic. By divine ethics, we are referring to ethics that transcend mere social convention, a way of being that is the actualization of the attributes of God. In 1995, the seed was planted for the Arizona Interfaith Movement, which was originally known as the InterFaith Action Coalition of Arizona. Interfaith Habitat for Humanity Houses – Completed in 2003 and 2005. Voices of Faith Concerts Past concert series hosted by AZIFM where the community could come to learn about different faith traditions through their music. Also, one could learn all the many ways the Golden Rule is stated in all the many different faith traditions. Golden Rule Resolution, May 13, 2003 – Making Arizona the First Golden Rule Sate in the nation. This initiative taken by AZIFM was inspired by Darl Andersen and kicked off our Golden Rule educational efforts. Golden Rule License Plate November 13, 2007 – initiated by AZIFM, and approved by the Arizona Legislature, signed by Governor Janet Napolitano. This beautiful state license plate, pictures the Grand Canyon, and states, “LIVE THE GOLDEN RULE.” It may be purchased at the Motor Vehicle Dept. at www.servicearizona.com. The plate is a traveling billboard for kindness and civility, and helps to support Golden Rule awareness and education in AZ. Faith Forums Community events where topics of the day are discussed by members of our Interfaith Council and other Community Leaders, follow by Q & A / Discussion. It’s a great place to better understand issues and different viewpoints. Watch for these on our Events Calendar. 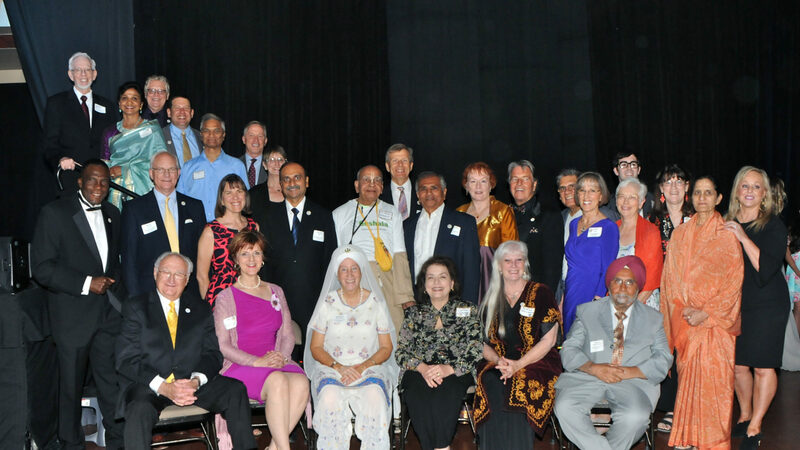 “Arizona Interfaith Movement Golden Rule Endowment Fund” was started with the AZ Community Foundation on 6/09/09 to ensure the sustainability of AZIFM. Holy Days Calendar Our Religious Holy Days Calendar will help you be mindful of all of the reasons to celebrate during the upcoming year. Now in digital format – GET IT HERE. 2019 is now available! AZIFM Speakers Bureau – Responds to requests to bring a better understanding of different faith tradition to the community. Call us at 602-734-5666 to request a speaker(s). Experience Interfaith – Features a Sikh Langar, followed by moderated small group discussions, with predetermined questions that further our understanding of our neighbor’s faith.